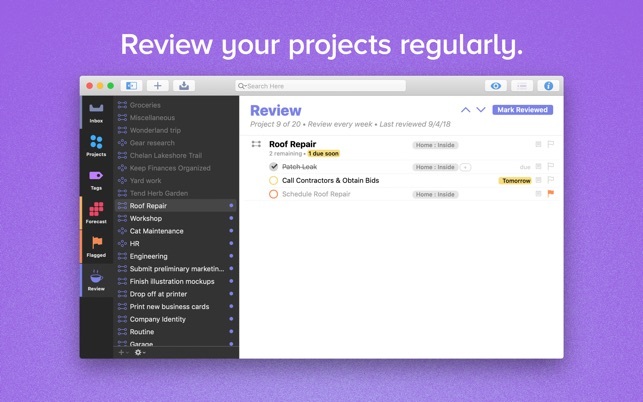 OmniFocus — now celebrating 10 years as the trusted, gold-standard to-do list app — brings unrivaled power and flexibility to your Mac, making it easy to work the way you want to work. Then let our free syncing system make sure your data is the same on every Mac. (And on OmniFocus for iOS and Web, available separately.) Because your data is encrypted, it’s safe in the cloud. • NEW: Tags add a powerful additional organizing tool. Create tags for people, energy levels, priorities, locations, and more. 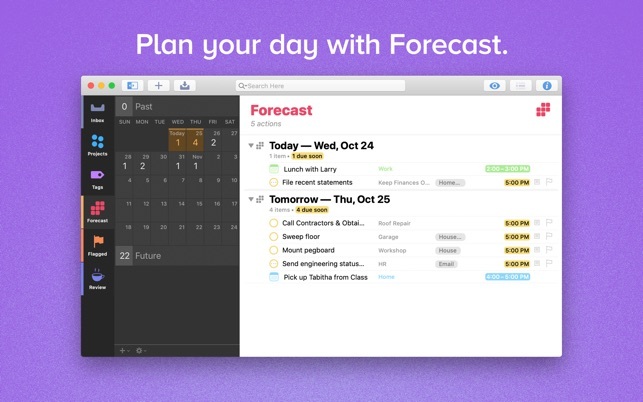 • NEW: The Forecast view shows your tasks and calendar events in order, so you can better see what’s coming up in your day. • NEW: Enhanced repeating tasks are easier than ever to set up — and they work with real-world examples such as the first weekday of the month. • NEW: The Modern, fresh-but-familiar design helps you focus on your content. • Inbox is where you quickly add tasks — save them when you think of them, and organize them later. • Syncing supports end-to-end encryption so that your data is safe wherever it’s stored, on our server or yours. 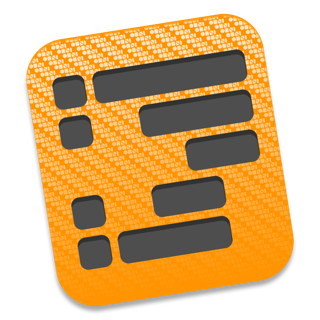 • Notes can be attached to your tasks, so you have all the information you need. • Attachments — graphics, video, audio, whatever you want — add richness to your tasks. • View Options let you customize each perspective by deciding what it should show and how it should filter your tasks. • The Review perspective takes you through your projects and tasks — so you stay on track. 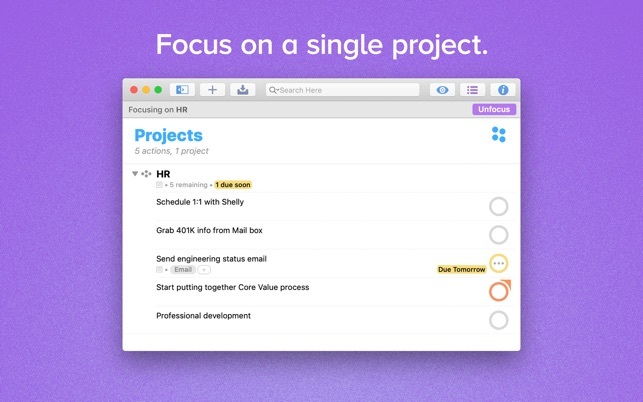 • OmniFocus Mail Drop adds tasks via email and works with services like IFTTT and Zapier (if you’re using our free syncing server). • The Today Widget shows you your most important items — you don’t even have to switch to the app to know what’s up. • Support for TaskPaper Text and omnifocus:///add and /paste lets you automate using URLs. 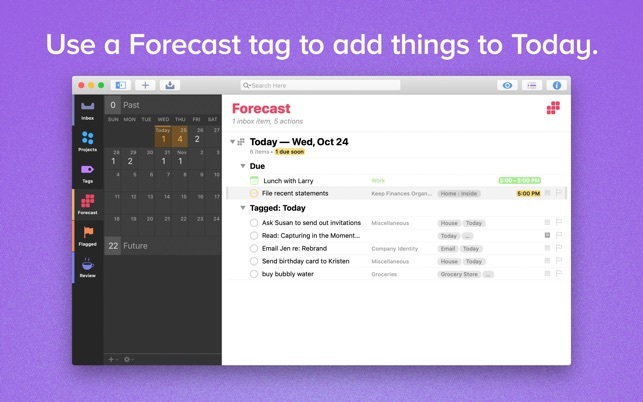 • NEW: Today’s Forecast can include items with a specific tag, and you can reorder those tasks however you choose, so you can plan your day better. • The customizable sidebar lets you organize your perspectives the way you want to, for super-fast access. • The Today Widget shows a perspective of your choice in Notification Center. • AppleScript support opens up a world of automation, using Apple’s Mac scripting language. 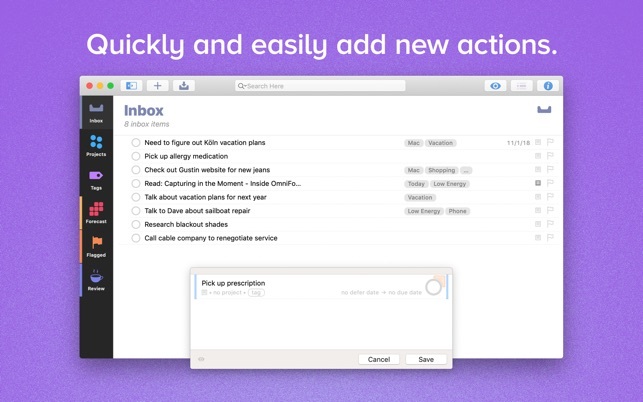 Download OmniFocus right now and start your free trial! The app includes a manual, and there’s plenty more documentation on the website. If you have feedback or questions, our Support Humans would love to hear from you! Send email to omnifocus@omnigroup.com, call us at at 1-800-315-6664 or +1-206-523-4152, or reach us on Twitter at @omnifocus. OmniFocus 3.3.1 is a minor update focused on bug fixes. 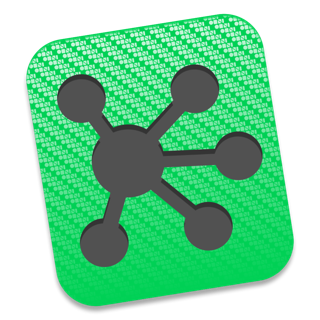 • Crashes — Fixed several crashes, include those most common in OmniFocus 3.2.x and 3.3. • Data Corruption — Fixed a problem where invalid XML could be inadvertently written to your database when importing items. This isn't your typical "to do list" app, though you can use it like one if you want. 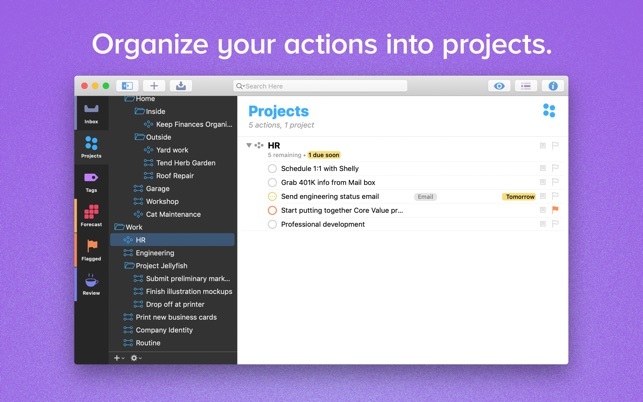 Think of Omnifocus as a master database of *everything* you need to do across all your areas of responsibility -- but with tools that help you work in managable chunks. And yes, that means if you want to make a to-do list you totally can, but you can also create meaningful contexts for your todos so you see (and do) them within the bigger picture. It takes a little time to get all this set up to your liking, but their onboarding tutorials and videos are very helpful. And once it is all running, it's so helpful to have all your tasks in one place instead of spread out among multiple apps, emails, notebooks etc. Having this trusted system certainly made my life run more smoothly once I had it set up. Oh, and if you're wondering about the strength of Omni's built-in sync service, I've been using it for years with consistently great results. Easily on par with the reliability of Dropbox or iCloud. 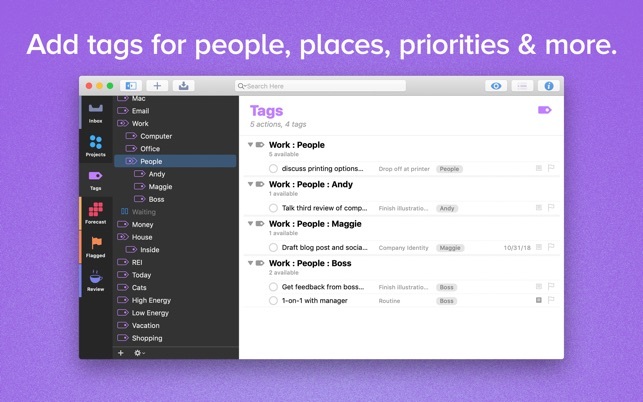 Works just like Omnifocus 2 but with the benefit of multiple tags which were previously known as contexts. In the prior versions of omnifocus, you could only have 1 context which was dictated by the GTD methoid. Now, the contexts have been changed to “tags” and a task can have more than one. One issue with omnifocus 3 is that In Omnifocus 2, events will appear as blocked off time in a schedule which visually helps me determine which other projects/tasks I can fit into my day. In Omnifocus 3, you lose this view and get your events as bullet points. I have reached out to omnifocus support for help 13 days ago followed by a second email 5 days ago and they have not replied. I’d expect that for the price they ask for on this app, that they would reply back at least within 24-48 hours. Hopefully this catches their attention. Overall, if you have Omnifocus 2, I don’t see a need to upgrade now to 3. Thank you for taking the time to write a review, and sorry for the lack of response to your email! Our support department is catching up with the emails received after OmniFocus 3 was released. We've prioritized those emails where a customer is unable to use the app and unfortunately that means that for emails where OmniFocus is working as designed, as in your case, we are approximately two weeks behind as of this writing. We're sorry to hear that the change to Forecast is not to your liking. 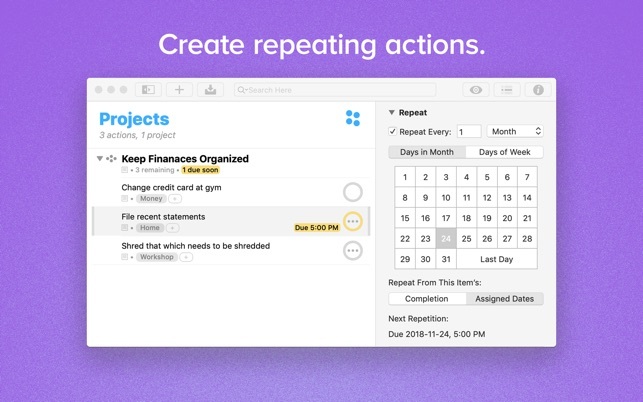 We first made this change in OmniFocus for iOS earlier this year, and most customers have found that seeing their actions in between their calendar events gives them a better idea of when they can get things done on a given day. However, you're not the only person to let us know you'd like to see the old view returned and we're currently evaluating whether that's something we can do along those lines in a future release. Overall, we're sorry to hear that you don't find the additions in OmniFocus 3 worth the price of upgrade. 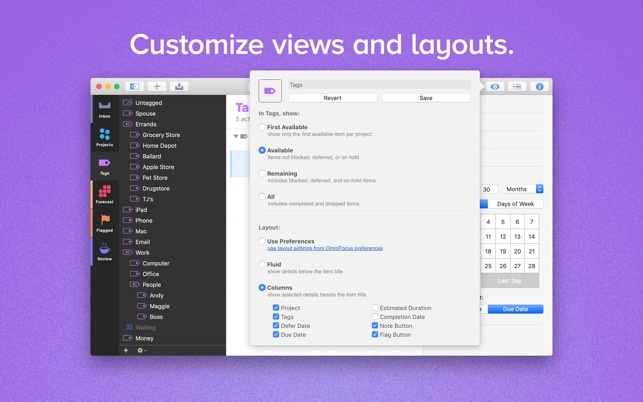 Hopefully you'll take another look in the future as we continue to add features to OmniFocus 3.